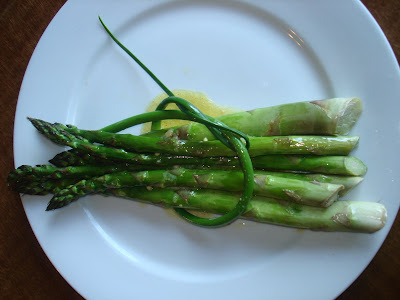 After receiving my harvest food share delivery on Wednesday, I couldn't help but try out the recipe of the week, the Asparagus bundles with homemade vinaigrette. It made a great side dish, and a pretty presentation. Preheat oven to 400 F. In a large bowl toss the asparagus in the olive oil and some salt and pepper. Spread the stalks out on a baking sheet in a single layer. Roast until tender but still firm and moist, about 10 minutes. In a small bowl, vigorously whisk together the mustard and lemon juice. Slowly drizzle in the olive oil, whisking quickly to emulsify the olive oil into the juice mixture. Toss together the roasted asparagus and vinaigrette. May be eaten warm or cold. I tied the bundle together with one of their garlic scapes. Even my asparagus-hating husband liked it, because he likes anything that has lemon on it. Almost impossible to go wrong with this easy side dish. I'm always looking for new ways to dress up asparagus. I'll have to try this one!